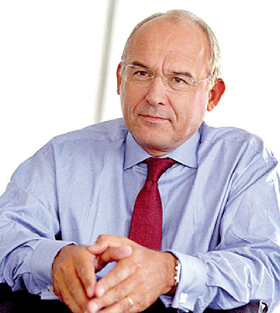 Valeo gave former CEO Thierry Morin a 3.2 million euro payout. PARIS -- Valeo's board of directors plans to ask shareholders for a "mulligan" today. The word come from golf and refers to the age-old practice of asking one's playing partners for another try after a really terrible shot. In this case, the French supplier's board wants its shareholders to vote down a golden parachute for former CEO Thierry Morin that was approved by the board during last year's annual shareholder meeting. At the time, the board recommended that shareholders support the potential payout to Morin. This was done to bring the company's remuneration practices in line with French best practices. The decision was similar to those taken by boards of most large, listed companies where conventional wisdom holds that it's better to pay off a longtime executive, when his time comes, rather than let him go to work for the competition. Small shareholders were predictably outraged, but Morin's supporters on the board -- and within Valeo's institutional investor shareholder base -- had the votes to push through the motion. Now, the board is asking the shareholders for a mulligan, and not just because they've realized that they hit a bad shot last year. Valeo fired Morin last March, supposedly over "strategic differences" and a desire to change the French supplier's corporate governance practices. The company thanked him for 20 years service, including eight as CEO, and paid him the 3.2 million euro severance package promised in his contract. The decision went down badly with the French government, which for years has been seeking to rein in executive pay, and do away with golden parachutes. The government's opinion has always mattered at Valeo. State-controlled Caisse des Depots et Consignations Group (CDC) has long held an 8.33 percent ownership stake, while the state-run strategic investment fund (FSI) paid 19 million euros for a 2.35 stake in Valeo last February. At the time of Morin's firing, government officials made clear that they were opposed to golden parachutes for executives at companies receiving government aid. But beyond expressing anger, there was little anyone could do. Until a scandal broke over secret recordings of board meetings. In April, Valeo discovered an elaborate, taping system in a conference room used for board meetings. Morin acknowledged that he installed the system, but insisted that his only objective was to facilitate note taking during meetings. It was not to spy on the board or its deliberations over his stewardship of the company. The explanation didn't satisfy the board, which filed a complaint with judicial authorities in May, effectively launching an investigation of its former CEO. While the board did not publicly accuse Morin of wrongdoing, it withdrew his honorary chairman title and simultaneously recommended that shareholders vote to cancel his severance package. All this sets up today's "do-over" vote at the shareholder assembly. And a likely lawsuit as Valeo seeks to recover the bonus it already has paid Morin. In normal times, the dispute would make for a dramatic Hollywood boardroom thriller. But with Valeo -- and the global auto industry -- facing the worst crisis in decades, most people have more important things to worry about.